Last week I gave my students in Wooster’s Invertebrate Paleontology course a fossil to identify (shown above), using any techniques they want. This was their first task in the course, so it was difficult for most of them. I hope it was a good introduction to practical paleontology and the mysteries of taxonomy. One student, Josh Charlton, nailed it all the way to the species. Several other students got close. 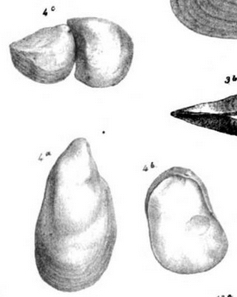 These are Middle Jurassic oysters properly identified as Praeexogyra hebridica (Forbes, 1851). I collected them many years ago from the Frome Clay (Bathonian) at Langton Herring along the coast of Dorset, southern England. They are extremely common fossils there, crunching underfoot as they erode out into the surf. These oysters lived in estuaries, where there was a mix of fresh and marine waters. In 1976, John Hudson and our friend Tim Palmer sorted out the systematics and evolution of this oyster species, moving it from Ostrea and Liostrea to the genus Praeexogyra. 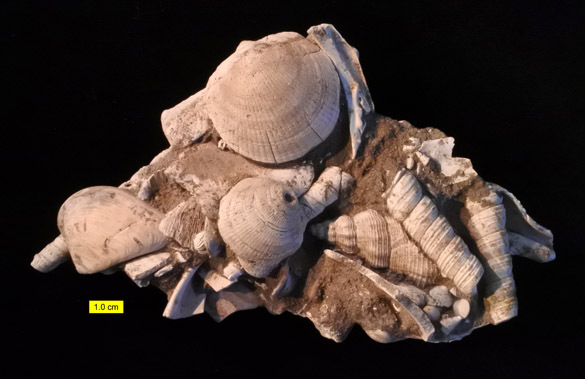 This oyster species was originally described in 1851 as Ostrea hebridica by Edward Forbes (1815-1854) from Jurassic sediments on the Scottish Isle of Skye in the Inner Hebrides (hence the name). As was typical of many nineteenth century fossil descriptions, the illustrations (above) and diagnoses are not particularly helpful. Forbes (1851) wrote, “Being very familiar with the oysters of the Wealden and Purbeck I cannot admit this identification, nor can I refer the Loch Staffin shell to any known fossil, although, as usual in this variable genus, it is difficult to express in words its marked distinctions.” We wouldn’t get away with such a conclusion for a new species today, but to be fair, oysters are notoriously difficult to describe. Forbes knew that this species “inhabited brackish water” in the Jurassic. Edward Forbes FRS, FGS (above) was born on the Isle of Man in 1815, the year of Waterloo. He was, as they said then, a sickly child unable to attend a regular school for long. He traveled to London when he was 16, though, to study art. That didn’t work out, so he became a medical student at the University of Edinburgh. Forbes was intrigued more with natural history than medicine (a common story! ), so he dropped his medical plans and set out to become a naturalist skilled in paleontology, mineralogy, zoology, anatomy and botany. His younger brother David became a well-known mineralogist. Edward Forbes caught on quickly. 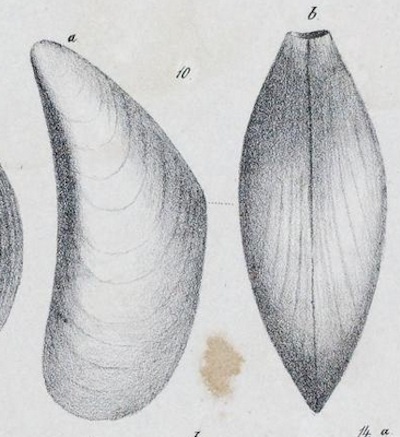 In 1838 he published a summary of the mollusks found on the Isle of Man. He was 23 years old. Forbes traveled widely, accumulating more observations, experiences and colleagues. He had many publications and advocated numerous hypotheses about the distribution of life forms. Some had lasting value (like the distribution of flora before and after glaciation intervals) and others were a bit naive (such as his idea that there is no marine life below 300 fathoms). He was a president of the Geological Society of London (1853), and in 1854 became the Professor of Natural History at Edinburgh, his driving ambition. Unfortunately his health problems caught up with him and he died that year at age 39. Edward Forbes played a critical role in the history of science by being a mentor of Thomas Henry Huxley. Forbes advised Huxley as a young man and helped him publish his earliest works. Forbes introduced Huxley to his circle of colleagues, which eventually led to the latter’s election to the Royal Society while only 26 years old. Huxley wrote a touching obituary for his young friend Edward Forbes. Anderson, F.W. and Cox, L.R. 1948. The “Loch Staffin Beds” of Skye; with notes on the molluscan fauna of the Great Estuarine Series. Proceedings of the Royal Physical Society of Edinburgh 23: 103-122. Anderson, T.R. and Rice, T. 2006. Deserts on the sea floor: Edward Forbes and his azoic hypothesis for a lifeless deep ocean. Endeavour 30: 131-137. Forbes, E. 1851. On the Estuary Beds and the Oxford Clay at Loch Staffin, in Skye. Quarterly Journal of the Geological Society 7(1-2): 104-113; plate 5, figs. 4a-4c. Hudson, J.D. and Palmer, T.J. 1976. 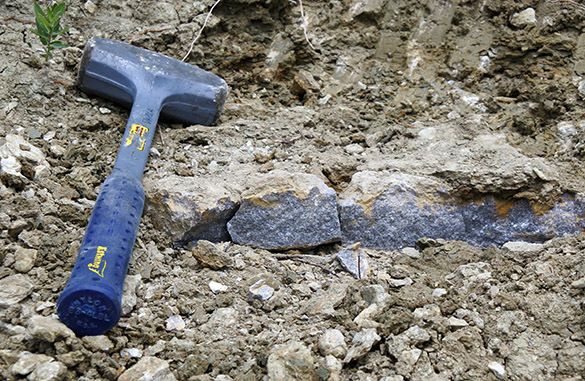 A euryhaline oyster from the Middle Jurassic and the origin of the true oysters. Palaeontology 19: 79-93. Wooster’s Fossils of the Week: A puzzle for my paleo students! Every year I start my Invertebrate Paleontology course by giving every student an “unknown” fossil to identify. (Here is last year’s version.) This is not always easy since each student gets the same species from the same horizon and with the same preservation. As classes get larger (I have 27 students this semester) I have to dig deeper into my collections. I found some good ones today that have enough variation to challenge them. Identify the fossil by scientific name as narrowly as possible. Phylum is a start, then Class, Order and so on down to the grand prize of correctly determining the species. Estimate the age of the fossil. Finding the period during which it lived is good; the actual stage it was found in, better. 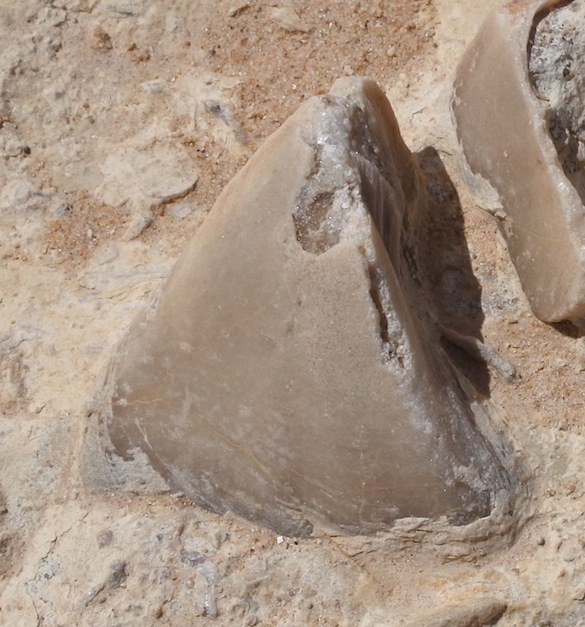 Make an educated guess at where this fossil was found. Chances are if you are right about the name and age, and then consider the places my students and I do fieldwork, you’ll come up with at least a region. Next week I will post here the identity and collecting location of these fossils, along with the name of the student who came the closest to the right answers. You, Dear Reader, can make a guess in the comments! Last month we featured a fossil slab kindly donated by Dale Chadwick of Lancaster, Pennsylvania. Dale is an enthusiastic fossil collector with a very useful website for his favorite sites and specimens. I promised to show the other side of this rock, and here it is. Again, this is a fine sandstone from the famous Calvert Formation (lower to middle Miocene) exposed at the Calvert Cliffs, Plum Point, Calvert County, Maryland, in the stratigraphic Shattuck Zone 10. 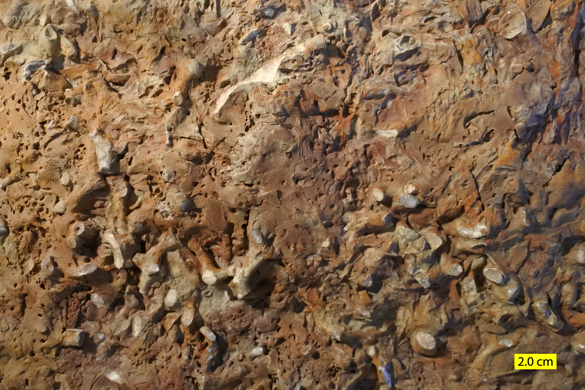 Some horizons are especially fossiliferous with large numbers of gastropods and bivalves. This is what we refer to us a death assemblage, meaning these shells are not preserved in their life positions but how they accumulated just before final burial. 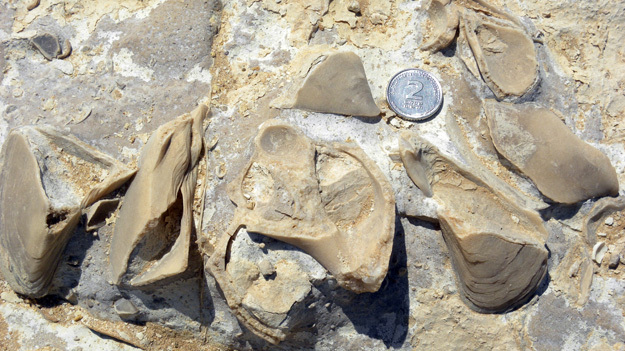 These rocks and their fossils were the initial basis of Susan Kidwell’s important work on taphonomic feedback, or how shell accumulations affect the succeeding living communities. Thank you again to Dale Chadwick for this gift! I will use it in my paleontology course this very month. Kelley, P.H., 1983, Evolutionary patterns of eight Chesapeake Group molluscs: Evidence for the model of punctuated equilibria: Journal of Paleontology 57: 581–598. Kelley, P.H. 1988. 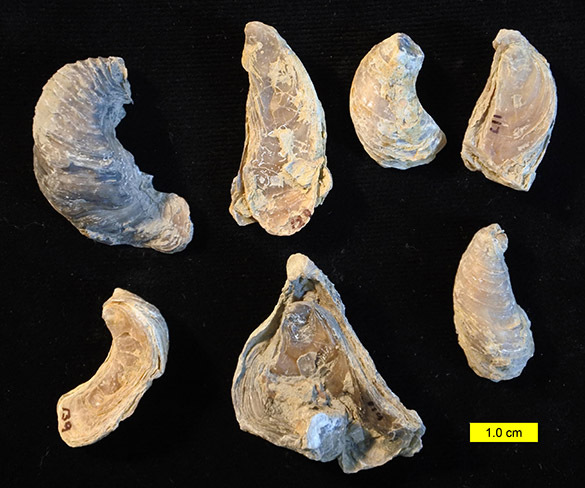 Predation by Miocene gastropods of the Chesapeake Group: stereotyped and predictable. Palaios 3: 436-448. Kidwell, S.M. 1986. Taphonomic feedback in Miocene assemblages: Testing the role of dead hardparts in benthic communities: Palaios 1: 239–255. Kidwell, S.M., Powars, D.S., Edwards, L.E. and Vogt, P.R. 2015. Miocene stratigraphy and paleoenvironments of the Calvert Cliffs, Maryland, in Brezinski, D.K., Halka, J.P. and Ortt, R.A., Jr., eds., Tripping from the Fall Line: Field Excursions for the GSA Annual Meeting, Baltimore, 2015: Geological Society of America Field Guide 40, p. 231–279. 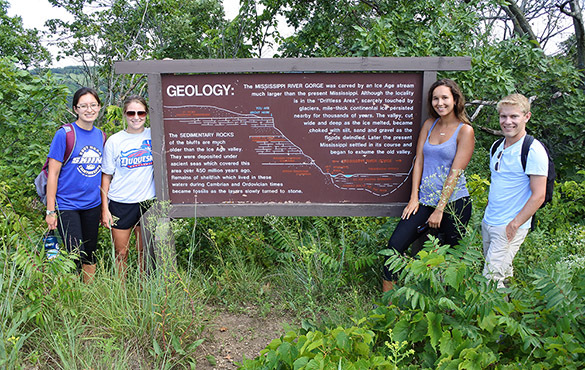 One of the little mysteries on the recent Minnesota research trip by Wooster students, faculty and staff is the origin of thin limestone beds in the middle of the thick shales of the Decorah Formation (Upper Ordovician). How did such accumulations of almost pure carbonate develop on such a muddy seafloor? Are they storm beds? Some sort of diagenetic feature? The records of brief sealevel changes? Brief interruptions in the supply of silicate sediments to the basin? Turbidites of carbonate material swept into a deeper basin? Above is a view of the top surface of such a limestone bed, this one found in the middle of the Decorah in a quarry near Rochester. 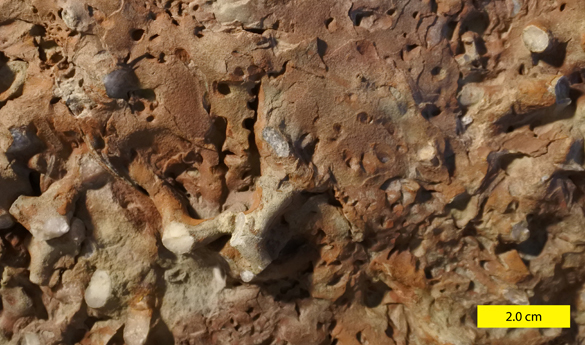 The light-colored twiggy objects are broken colonies of trepostome bryozoans; the network of holes are burrows of a trace fossil called Chondrites. An outcrop view of one of these carbonate beds in the Decorah Formation, this one at Wangs Corner (N 44.41047°, W 92.98338°). 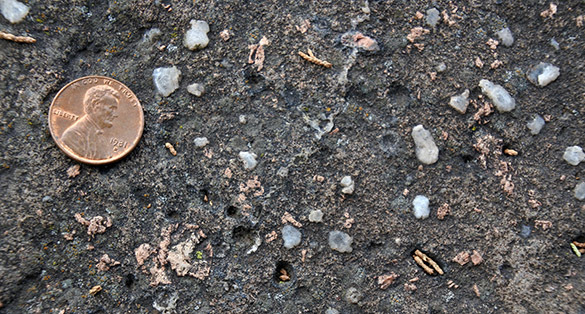 These units are only a few centimeters thick, and have a variety of petrographic fabrics. This one appears to be an almost pure biosparite with Thalassinoides burrows penetrating from above carrying down a light brown sediment. Back to our slab from the Decorah with a closer view of the trepostome bryozoans and round holes representing the trace fossil Chondrites. Sawing a rock and then polishing a cut surface is always fun and profitable! This is a cross-section through the slab, oriented with the top upwards. A little bit of iron oxide diffused through the sediments provides the touches of red in the fabric of the limestone. 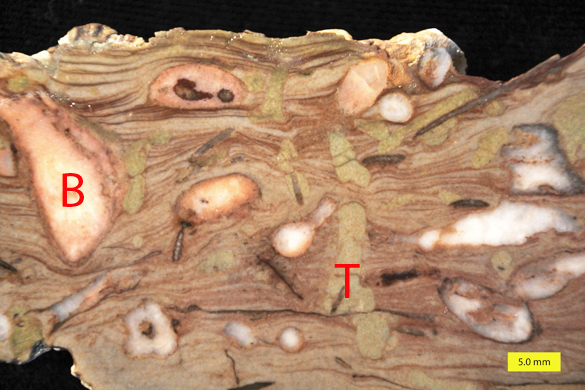 This closer view of the cut surface shows the exquisite bedding features, along with the bryozoans (B) and trace fossils (T) in cross-section. The burrows pass through the bedding and pie down into the rock a brownish sediment from above. These burrows were made by some sort of deposit-feeding organism that was mining the sediment for organic material. The bedded sediment may be slightly graded in grain size, meaning the many beds may consist of thin fining-upwards sequences. Note how the beds are contorted around the bryozoans as if they were dropped into the sediment while it was still accumulating. This slab of bryozoans, trace fossils and contorted laminae looks to me like a storm bed formed quickly during and after the seafloor was significantly disturbed by currents. 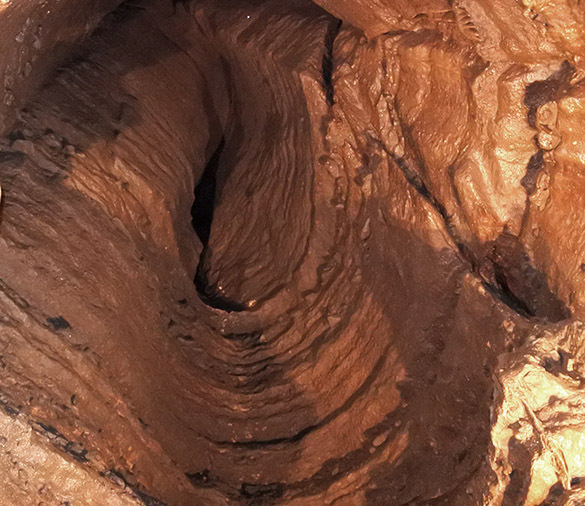 When conditions returned to normal some worm-like deposit-feeders in the fine sediment above sent their mining tunnels down deep into the carbonate looking for food. We have a hypothesis to test! 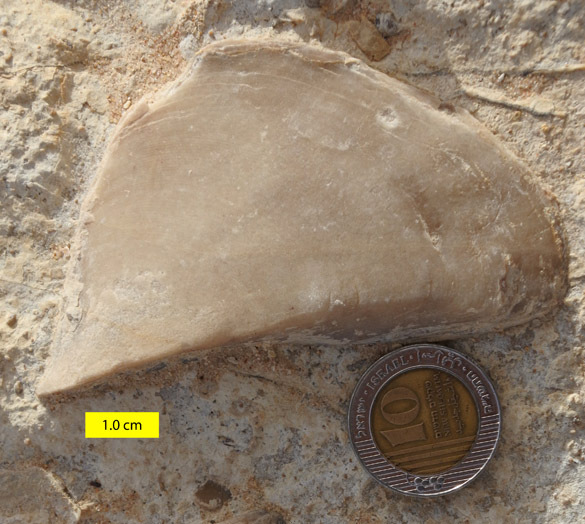 This week’s specimen comes from one of my favorite fossiliferous units: the Matmor Formation (Middle Jurassic, Callovian) of Makhtesh Gadol in southern Israel. I’ve been delighted by the fossils and lithologies of the Matmor since 2003. This particular fossil is exposed in a bedding plane of the very rich subunit 65, which I’ve mentioned before in this blog. It is a mytilid bivalve identified as Mytilus (Falcimytilus) jurensis It has the classic wing shape of its order. M. jurensis is very common in the Matmor Formation, especially in the upper third where it can be seen protruding from limestones at a variety of angles. The species was widespread throughout the Tethys Ocean, now recorded by sediments in the Middle East and Mediterranean regions. Mytilid bivalves are very common today as well, and they have the same life mode as they did at least 150 million years ago. They attach to hard substrates in shallow waters with strong fibers they secrete called byssal threads. Above we see our M. jurensis shell with several others clustered around a gastropod shell to which they were attached. The organic byssal threads are long gone, of course, but the shells remain in their living positions. I like to use these Fossils of the Week to explore their taxonomic histories. The specimens, after all, are usually not exceptionally well preserved or rare, but they all have stories. Mytilus (Falcimytilus) jurensis proved to be a challenge when it came to identifying the author of the species. First I went to the online catalogue of the Muséum National D’Histoire Naturelle in Paris — an excellent resource. There I found the above image and information. Someone named Roemer named the species in 1836. So who was this Roemer and what was the publication? 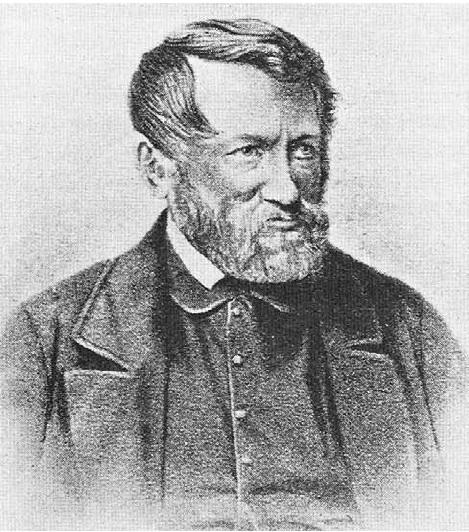 After considerable searching, I learned our taxonomist was Friedrich Adolph Roemer (1809-1869), a German geologist born in Hildesheim, part of the Kingdom of Westphalia. He had a younger brother, Carl Ferdinand von Roemer, who was also a geologist, creating some confusion. 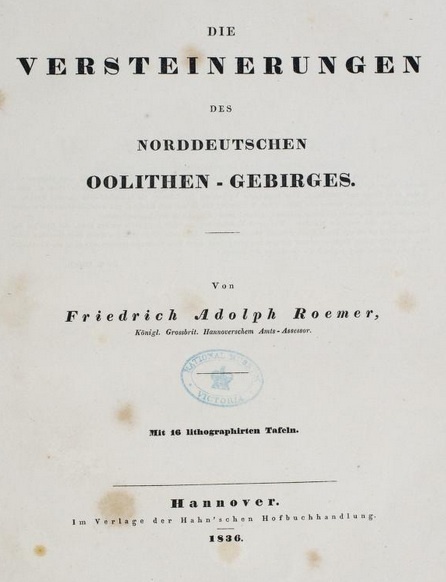 Friedrich Roemer has an 1836 book (above) that roughly translates as The Fossils of the North German Oolitic Mountains, “oolitic” referring to a kind of limestone common in the European Jurassic; for awhile it was essentially synonymous with “Jurassic”. On Plate IV, fig. 10, of this 1836 book is a pair of drawings of Mytilus jurensis. So far all is on track for sorting out the taxonomic history of the species. Surprise! When we look at the description in the text on page 89, we see that Roemer gives an undated credit for the species to “Merain”. Who is Merain? I thought I’d never find the identity of this “Merain”, but through the extraordinary resource of Google Books, I uncovered the earliest record of Mytilus jurensis. It is on page 13 of Thurmann (1833). Note that following the species (fourth line above) is “Mèr.” and then “n. sp.”, meaning “new species”. (I have no idea what the intervening “M. Bas.” indicates. [Update: See comment by Christopher Taylor below.]) There is no description of the species, and no illustration, but there’s the first mention of it. So is “Mèr.” short for Roemer’s “Merain”? Turns out Roemer misspelled the last three letters — it is “Merian”. 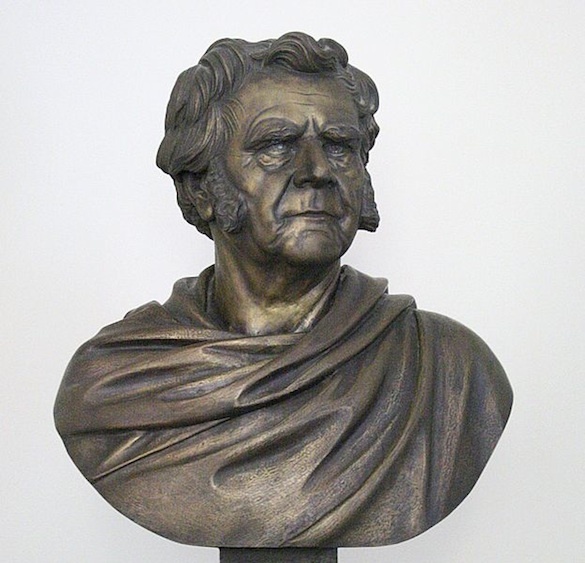 Peter Merian (1795-1883) was a Swiss geologist and paleontologist who was born in Basel. 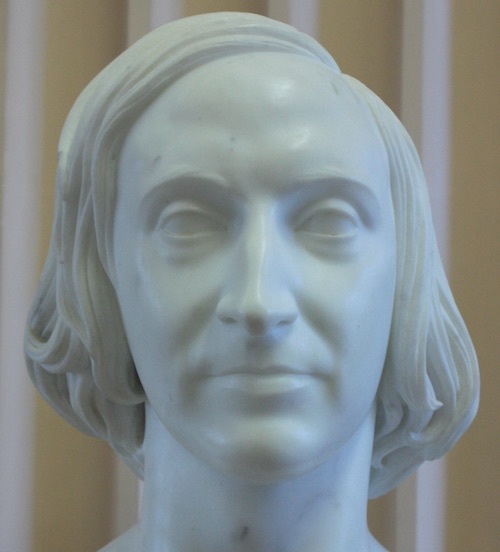 He studied scientific topics at the University of Basel, the Academy of Geneva, and the University of Gottingen. After two years in Paris, Merian returned to Baasel and began to specialize in the geology and fossils of the Jura Mountains. He was appointed a professor of physics and chemistry at the University of Basel, and later an honorary professor of geology and paleontology. He was also Director of the Natural History Museum in Basel. Along with his work on Triassic and Jurassic fossils, he also made contributions to glaciology and meteorology. Peter Merian died in Basel in 1883 after a long, notable career. He certainly looked the part of a dashing 19th Century Swiss geologist. Kevin McNally could play him in the movie! And now we know that he was the man who named Mytilus jurensis in 1833. Roemer (1836) was probably credited with the species at one point because he had the first description and figures. Merian, apparently, just provided the name in someone else’s book. Here is an 1829 geological map by Peter Merian of a portion of the Jura Mountains, one of the first of the region. Cox, L.R. 1937. 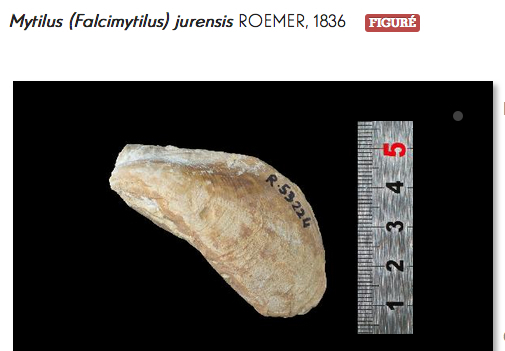 Notes on Jurassic Lamelibranchia V. On a new subgenus of Mytilus and a new Mytilus-like genus. Journal of Molluscan Studies 22: 339-348. Freneix, S. 1965 – Les Bivalves du Jurassique moyen et supérieur du Sahara tunisien (Arcacea, Pteriacea, Pectinacea, Ostreacea, Mytilacea). Annales de Paléontologie, t. 51, vol. 1, p. 51-113. Liu, C. 1995. Jurassic bivalve palaeobiogeography of the Proto-Atlantic and application of multivariate analysis method to palaeobiogeography. Beringeria 16: 31123. Liu, C., Heinze, M. and Fürsich, F.T. 1998. Bivalve provinces in the Proto-Atlantic and along the southern margin of the Tethys in the Jurassic. Palaeogeography, Palaeoclimatology, Palaeoecology 137: 127-151. Merian, P. 1829. Geognostischer Durchschnitt durch das Jura-Gebirge von Basel bis Kestenholz bey Aarwangen, mit Bemerkungen über den Schichtenbau des Jura im Allgemeinen. Zürich. Roemer, F.A. 1836. Die Versteinerungen des Nordeutschen Oolithen-Gebirges. Hahn. 218 pages. Thurmann, J. 1833. Essai sur les soulèvemens Jurassiques du Porrentruy, avec une description géognostique des terrains secondaires de ce pays, et des considérations générales sur les chaines du Jura. Mém. Soc. Hist. Nat. Strasbourg 1: l-84. 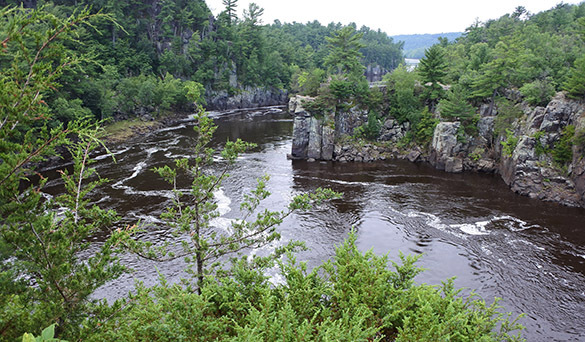 Rochester, Minnesota — On its last day in the field, Team Minnesota had a geological trip to the Dalles of St. Croix in Interstate State Park, Wisconsin and Minnesota. It was beautiful, and we practically had the place to ourselves, not counting several million mosquitoes. The Dalles are where the St. Croix River cuts through a series of Middle Proterozoic (1.1 billion year old) basalts. (Dalles is a French word for a narrow river gorge with rocky sides.) The basalts are of the Chengwatana Volcanic Group and represent ten thick flows of lava. They are much more resistant than the surrounding sedimentary rocks, so the river was forced into a narrow, deep and fast channel. 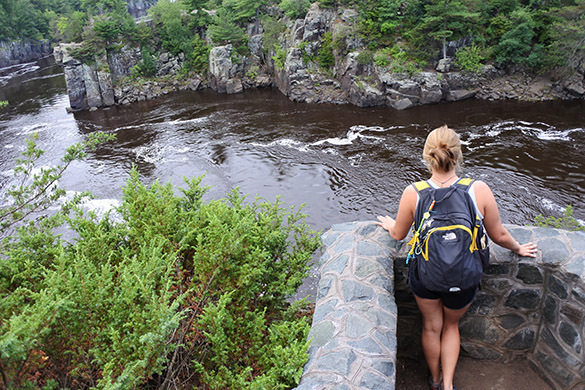 In the top image Rachel Wetzel is looking across the river to the Minnesota side. 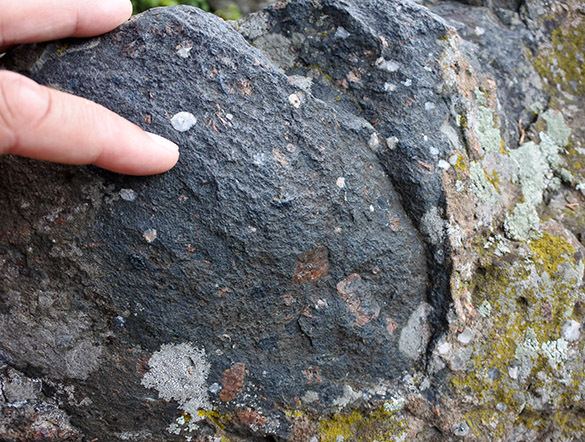 The basalt tends to fracture along vertical joints with the force of the water, producing vertical cliffs. Excursion paddle-wheeler boats ply the river here. We saw very few tourists, though.. The basalts have many vesicles (gas bubble holes) that later filled with minerals, producing a structure called an amygdale. (Thanks, Dr. Pollock!) The lava flows vary in the number and size of their vesicles, and the mineralogy of the amygdales. The round white features in this basalt are quartz amygdales. There are also some brownish feldspar phenocrysts (large crystals in the basalt matrix). 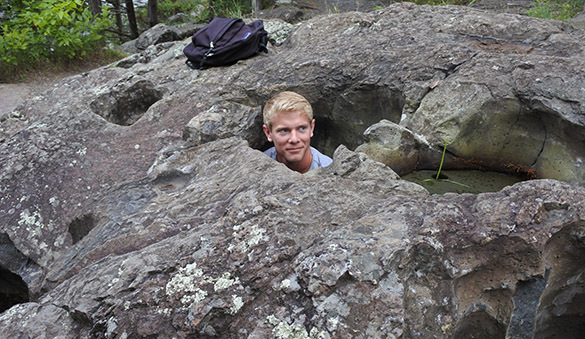 There are enormous glacial potholes excavated into the basalt at the Dalles of St. Croix, some as high as 30 meters above the present river. They were formed about 10,000 years ago as glacial meltwater poured across this basalt in volumes many times higher than the river today. Stones would become trapped in eddies and whirlpools, spinning around and grinding their way into the basalt below them. 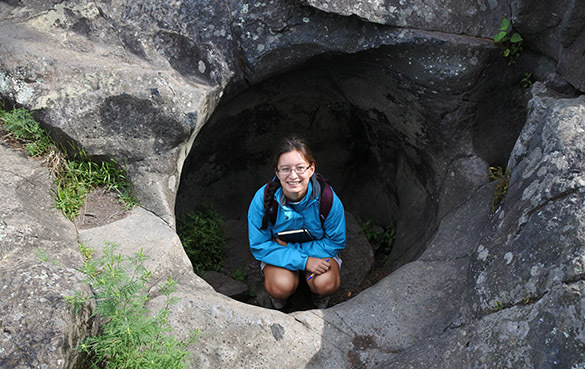 These may be the largest glacial potholes in the world. Etienne Fang shows the size of one. She is sitting on debris, so the holes goes considerably deeper. Dean Thomas found one just his size. Dean turned out to be attractive to more than just ticks and chiggers. 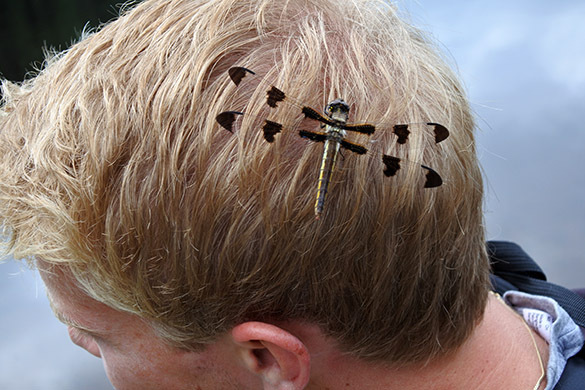 A dragonfly found his hair worth exploring. 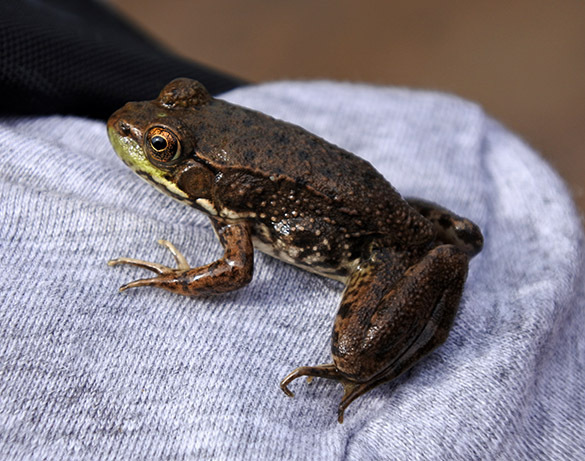 And this bullfrog was comfortable on his shoulder. 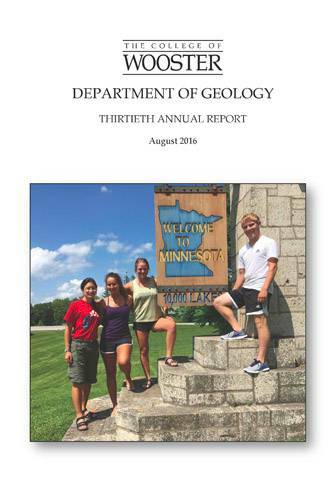 Thus Team Minnesota 2016 completed its expedition! Tomorrow the students fly out of the Minneapolis-St. Paul Airport, and Nick and I drive 12 hours or so back to Wooster with our samples and equipment. Our next posts will be about our observations and ideas from labwork back in Wooster. 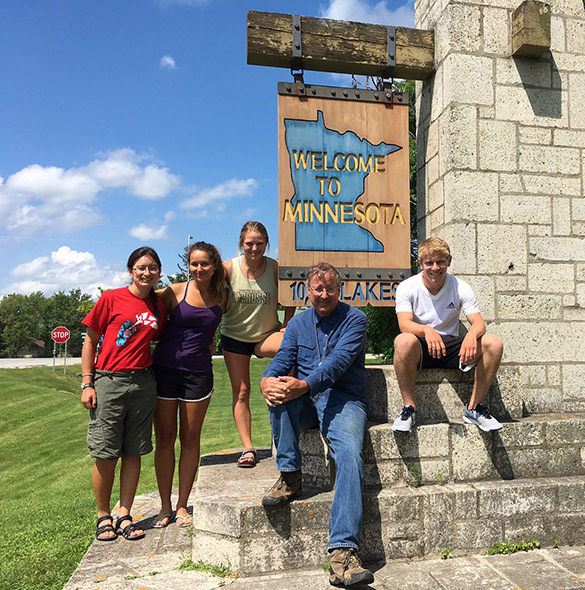 Rochester, Minnesota — Since Team Minnesota efficiently finished its fieldwork yesterday, we have two days before the students fly out of the Minneapolis-St. Paul airport. The good weather has given us a gift of time, so we’re using it like enthusiastic geologists. This morning we drove down to Harmony, Minnesota, near the Iowa border to visit Niagara Cave. 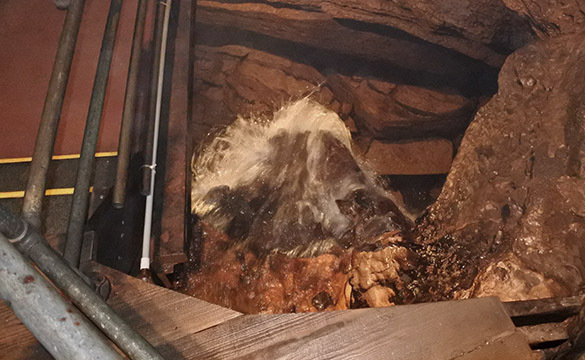 This cave is unusual because it has a stream with a 60-foot waterfall and (a new term to me) active vadose canyons. 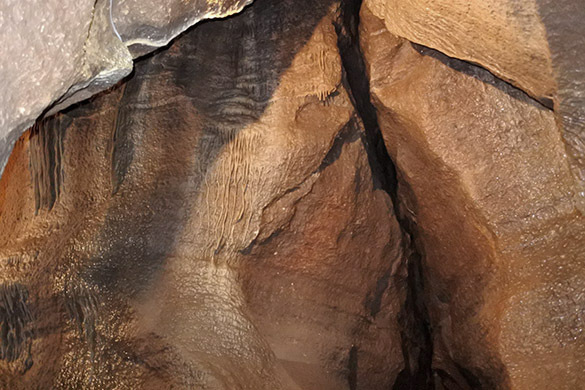 The cave is entered down a sinkhole into the Dubuque Formation, and then it descends through the Stewartville Formation and reaches its lowest level in the Prosser Formation. These are Ordovician units above the Platteville-Decorah-Cummingsville sequence we did our work with. The cave passages follow joint patterns inn these limestones. It is plenty wet down there. My cave photos are not the best with my small flash. Here at least we can see a vertical joint passage and flowstone structures. 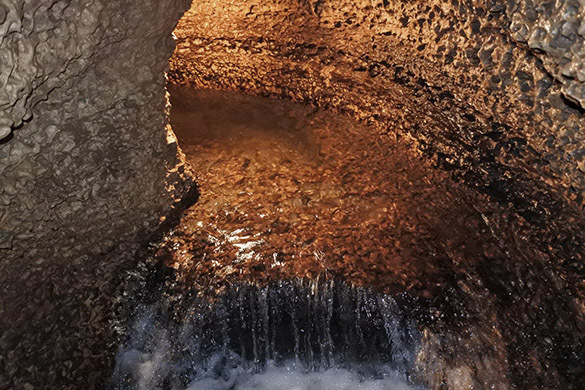 The fast-moving stream running through Niagara Cave. The top of the 60-foot waterfall. This view up into a dome shows the internal stratigraphy visible in the limestones. 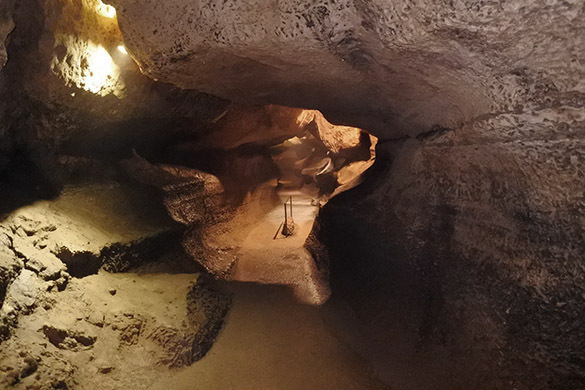 Plenty of fossils are exposed in the cave. These are sections of gastropods in the ceiling of one section. They were high up so I have little idea of their sizes. I’m just amazed the photo worked out. 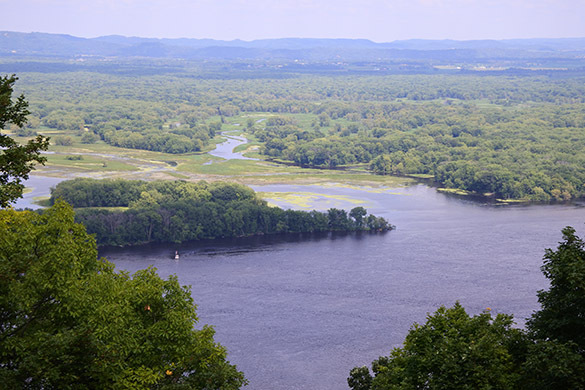 In the afternoon we drove northeast to Great River Bluffs State Park on the Mississippi. 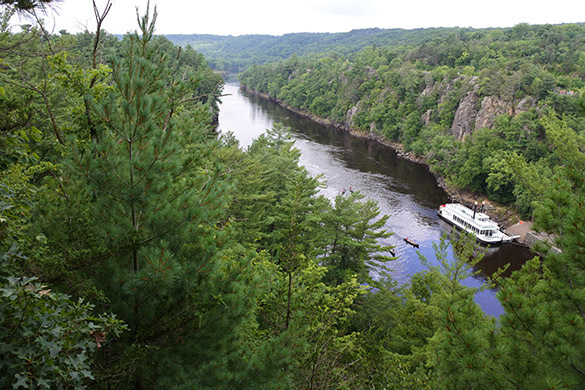 We had spectacular views of the river and its opposite bank in Wisconsin. 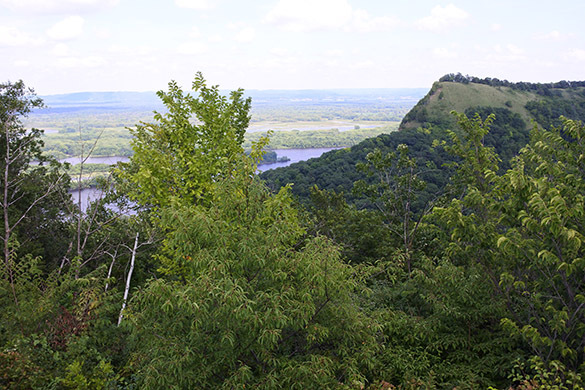 Above is a view eastward of Queen’s Bluff overlooking the river. The main navigation channel of the Mississippi is in the foreground, with the Black River Delta in the middle ground. In the distance are the bluffs on the Wisconsin side, about 4-5 miles away. Team Minnesota is ready to answer any geological questions!